The thought of a Trump golf course in Dubai conjures up several images. Opulence, grandeur, showmanship, fountains and potentially vulgar all come to mind. Trump Dubai doesn’t deliver any of these. Instead, it is a wonderful addition to the golfing scene in the United Arab Emirates and will delight golfers of all standards. First things first. They have created a really high-end golf experience, obvious from the moment of arrival. The reception area is like a 5 star hotel with changing rooms to match. The welcome we received was really warm. Even before we arrived, we had been getting good vibes. There had been a slight issue with our starting time and we risked being cancelled, but the social media team spotted our tweet and the Director of Golf immediately sorted us out without any fuss. Big tick. The driving range was immaculate - no wonder Rory McIlroy had been practising there a few days previously - and there was a great short game area. My only question would be why they made the putting green quite so sloped. It was hard to find a flat part of the green and thankfully the greens on the course were far less severe. Gil Hanse is the architect here and that tells you a lot about what to expect. The course is very playable from the tees. The course ranges in length from 5,200 to 7,200 yards but from the middle tees at 6,500 we didn’t feel we were getting anything but the perfect experience. However, there are clearly lines to take which will set you up for success. You won’t need to worry about losing balls here. Fairways are wide and if you do go astray you will find yourself in a scrubby sandy area. These are difficult to play out of if you are too greedy and there’s a lot of vegetation to impede you, but you’ll find the balls no problem. This is definitely a course of 2 halves. The front 9 is played with a backdrop of several large apartment complexes. But these are mature buildings of a large scale, set back from the course. The back 9 however is surrounded by a housing estate of identical box-type constructions, currently lying empty. The second half was definitely less visually appealing and suffered as a result. This is definitely a course which you should score better on with repeat plays. Some of the pins were perched on top of punishing crests and playing the yardages led to balls falling away into quite severe run-off areas. A good short game is worth a lot of shots around here. This is a golf course you will have fun playing, it will make you smile and keep you entertained. There are plenty of fun features - the Biarritz green on 7, the driveable par 4 11th where a 3 or 6 are equally possible for most. The par 3s really stood out to me as a strength. Hanse has eschewed the mundane four par 3s of 190 yards and instead tests you with a range of 130 to 190 yards from the 6,500 yard tees. They’re well bunkered, well shaped and a real delight to play. You can absolutely walk the course (though most will take the buggy included in the green fee) as the distances between greens and tees are short and the course flows very well. Unlike some other courses in the area, there was no hesitation in letting us walk it and the pace of play was fantastic. We were in the middle of a society shotgun but the whole field got round in 4 hours with no waiting at all. A real credit to the layout and playability of the course. The conditioning of the course was, like so many around here, phenomenal. It played firm and fast and, while not a true links, this was no bombers golf course. There wasn’t much not to like about this place! The course obviously has the Trump name attached to it and livery to match, but my understanding is that the ownership structure is slightly different from the likes of Doonbeg and Turnberry and there is less of the ‘in your face’ Trump. No framed magazine covers, less gold. If anything it feels slightly understated - who’d have thought it! For all I liked this course, I struggle to put it quite in the same league as Yas Links, an hour away in Abu Dhabi. Kyle Philips’ Yas is a sterner test in a more spectacular setting. Trump feels like a more fun cousin. I find it hard to completely separate the course itself from the setting. If you took this course and put it down, say, on the great run of courses in Scotland around Western Gailes, I would probably rank the overall experience higher than I have here. You can’t get away from the buildings all around, especially on the back 9, and that is a shame. However, I think this is the best course in Dubai. Don’t even think of playing the nearby Earth course if you have the option to tee it up here. The Majlis at the Emirates has held the title of highest ranked course in Dubai for a long time but I think I would split 10 rounds 6:4 in favour of Trump. If you are in the area, make sure you add this great course to your list. You can book the course via the club here. They say you can only book 10 days out but if you need to book further ahead just call them or email them on the contact details below. The pricing policy seems quite flexible, with different green fees at different times of the day and flexing due to demand. Expect to pay somewhere between around 500 and 1000 Dirhams (£100-£200). This includes a GPS activated buggy. Trump Dubai is pretty close to the Earth Course and you are only 20 minutes from the Emirates so you are spoilt for choice in the area. Bear in mind as well that Abu Dhabi is only an hour away and Yas Links is well worth a visit. 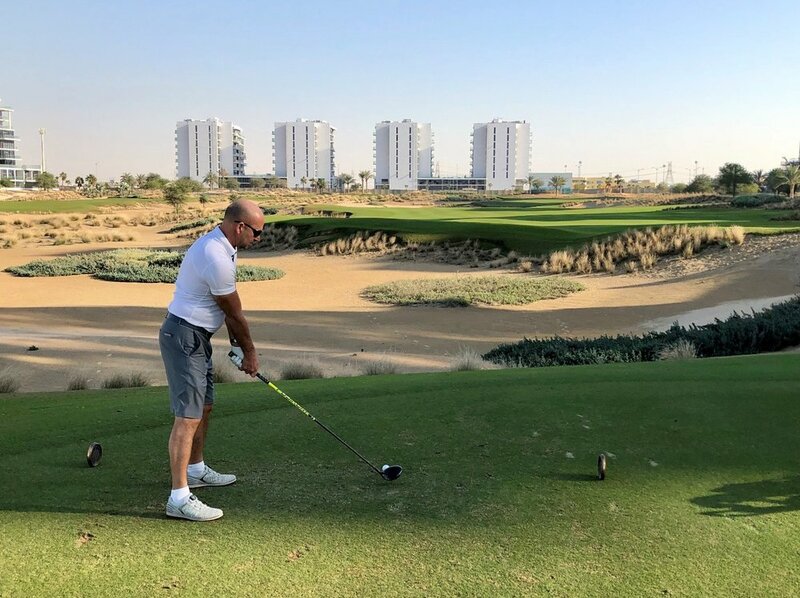 If you want to see the details of a trip which took in the Dubai Dersert Classic as well as some great course,s then check out the tour tips of my Emirates review here. Tee times on these courses are expensive and hotels can be, so this is one of the occasions where I think it can be worth using a tour operator - Yourgolftravel and golfbreaks will both be able to help you out and probably save you some cash.